Icelandic post-punk trio Kælan Mikla returns for the group’s third album, Nótt eftir nótt. Topping a year that catapulted the band onto stages shared with the likes of The Cure and Placebo, Nótt eftir nótt is Kælan Mikla at their most confident, and their most deadly. It’s been five years since Margrét Rósa, Laufey Soffia, and Sólveig Matthildur formed the band in Reykjavik, and after several tours and high-profiles stages, as well as two critically-acclaimed albums, Kælan Mikla has truly brought their A-game. Starting off quietly with a creepy, gothed-out and ethereal intro, Nótt eftir nótt erupts with post-punk brilliance and synthlines that harken back to the bad old days of the Batcave, big hair, and Egyptian-inspired eye-liner. Tracks like the melancholy “Hvernig kemst ég upp?” are wonderfully delightful, while the band goes for the big goth dance number on “Skuggadans,” succeeding with glorious ease. Near the end of Nótt eftir nótt, when you’ve already ingested a healthy dose of Diamanda Galas meets The Birthday Party, the title track, produced by popular Icelandic electronic wizard Bang Gang, is basically perfect. Tapped by The Cure frontman Robert Smith to play his edition of Meltdown Festival would be a pretty amazing feat, but for Kælan Mikla, it’s just another day. Indeed the death-rock turned post-punk trio from the heart of Reykjavik has been turning heads since they formed five years ago in 2013. It all started after the three (Margrét Rósa Dóru-Harrysdóttir on bass, Laufey Soffia taking lead vocals, screeches, and devastating death-rock laments, and Sólveig Matthildur Kristjánsdóttir on keys) won a poetry slam competition at the City of Reykjavik library, featuring Sólveig’s writing. Then, in the summer of 2014, before synthesizers, before any electronic instruments really, they cranked out a purely raw bass, drum, and vocals session of death rock gems that are electrifying and, frankly, gorgeous. 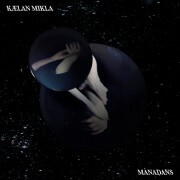 With Alison MacNeil (Kimono) producing, the band completed its first album, Mánadans, only to have it shelved. 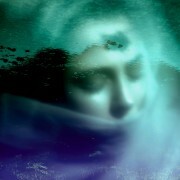 Since then, Kælan Mikla have been invited to Roadburn and Iceland Airwaves. They will soon embark on their first tour of South America. And they’ve been invited to tour with Drab Majesty and King Dude. And then there’s Robert Smith, who came knocking and extolling the band’s youthful energy and poetic darkness. The band’s long lost death-rock masterpiece Mánadans now gets a deluxe worldwide issue via Toronto-based Artoffact Records. Available on vinyl, CD, and digital formats, the album is fully remastered and includes the bonus track Reykjavík til staðar, as well as the demo version of their hit song Kalt.